This was a route chosen to tidy up some of the few remaining eastern fells for me. If I was climbing Red Screes alone it would be via the longer but less steep route from Ambleside. The addition of High Hartsop Dodd, Little Hart Crag & Middle Dodd somewhat forced the issue regarding route selection to the much steeper ascent from the Brothers Water side. 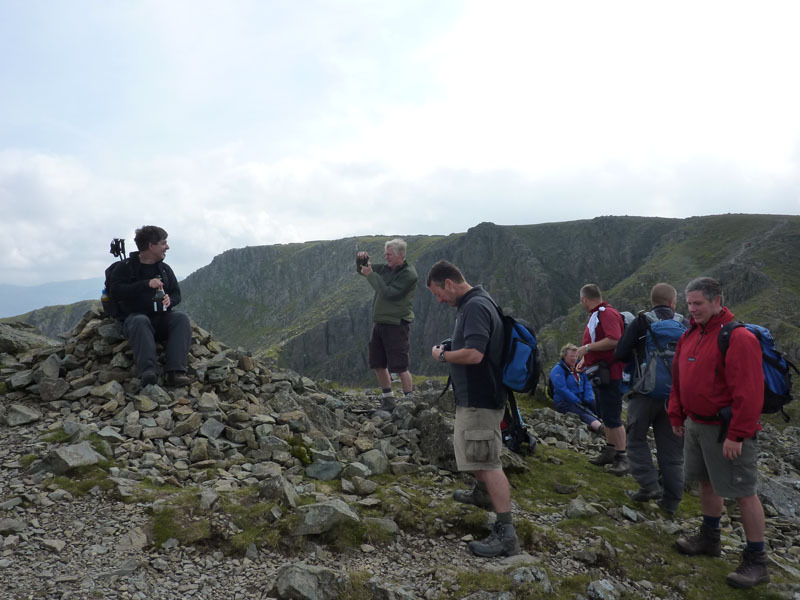 It was with some not inconsiderable uphill effort that the summit of High Hartsop Dodd was gained. Thankfully the onwards route was much easier up until the final push to Red Screes summit. Red Screes summit is a large and fairly flat grassy plateau adorned with a sturdy trig point, a large wind shelter and small but lovely tarn. There are superb views in all directions including Great Gable and the Scafells along to the whole Coniston range. Eastwards are views from Yoke all the way along to Place Fell with the High Street range in view further back. It would be a great place to wild camp. This was nice little route. Short but steep and with fine views all along the way, especially from Red Screes which is great summit and one I will definitely be visiting again. This is not really a review as such. It is just my opinion of the Tarptent Scarp 1 based on my wild camping experience in the Lake District over the past 2 years in a variety of typical weather conditions for the region. I can't compare it to any other tents yet, as this is my first one. I bought the Scarp 1 about 2 years ago after researching backpacking tents on the Internet. My requirements were; lightweight (under 2kgs), able to withstand the high winds and adverse weather conditions found on UK mountain tops (ideally in all 4 seasons), plenty of room for 1, a good sized porch, quick and easy to pitch & preferably fly first, bathtub floor & I didn't want an all mesh inner which is popular with many US tents. I had narrowed the selection down to the following tents, all of which I'm sure would have made excellent choices but had the following niggly issues (according to reviews) when compared to the Scarp 1; Hilleburg Akto (expensive, low head height, heavyish for the size, condensation issues), the Terra Nova laser competition 1 (very light but pricey and a bit fiddly to pitch tight, smallish, 3 season), Wild Country Zephyros 1 (slightly small internally, heavyish, 3 season), Vaude power lizard (very spacious & light but apparent condensation issues & can be fiddly to pitch tight, 3 season). The Scarp 1 seemed to tick all the boxes including the additional benefits of having 2 porches and being a true 4 season shelter with the option of using additional cross over poles to make it self-supporting and capable of withstanding snow. The only concerns were that I would need to seam seal it myself and that I would need to have it imported from the US cottage manufacturer Tarptent, of which I new very little. After some deliberation I placed my order and about 2 months later my new Scarp 1 arrived, complete with an import duty fee of around £35. Despite this, it was still cheaper than all the other candidates bar one. Having studied the pitching video on the tarptent website I set it up in the garden and sealed the seams using McNett silicone sealer thinned with a little white spirit as described in this Gossamer Gear article. I was now ready to take it out to the fells and perhaps a little ambitiously, chose the summit of Scafell as my inaugural wild camp. That trip is described here, and a selection of other wild camps since then are listed here. Two years later I can confidently say that I have no regrets at all in buying this tent. It has exceeded my expectations and provided a great introduction to wild camping. That does not necessarily mean it will be right for others. It's certainly not the lightest tent at 1.4kgs including 6 stakes (cross poles add a further 340 grams) but for me the extra weight is more than compensated for by the usable space and wind stability. The following points are worth mentioning though, particularly if you are considering ordering one for yourself. The 2 porches are a godsend. I stash my rucksack and boots in one porch and all my food and cooking gear in the other, which also serves as the door. If the wind changes direction, I can easily swap sides. Pitch the tent 'end on' to the wind and situated so that the doors open onto the sheltered side. The cross poles are really not needed unless heavy snowfall is expected. They don't seem to add any obvious additional wind resistance except that they can help keep the fly from blowing onto the inner, but so can the use of trekking poles - see next point. If not using the cross poles then tie the straps to each other to stop them flapping against the fly sheet. I know of some Scarp users who felt confident enough to remove the straps entirely so that they can no longer use the cross poles and yet have still used it in all 4 seasons with no problems. If the wind is blowing strongly, you can use a trekking pole and some guy line to 'lift' the fly on the windward side (see picture below). This stops the fly from blowing onto the inner. I have also since added a small loop of shock cord to the tent attachment point so as to avoid a sudden gust tearing it off (which happened to me on High Stile). You can use this set up at either end or just the windward side depending how strong the gusts are. When pitched with hoop guys and pole lifters this tent is rock solid in the wind. I have been in it in some wild weather without any drama. The tent does not include guy lines for the hoop attachment points but thankfully the excellent backpackinglight.co.uk sell a cord & cleat bundle which is great value and will do the job nicely. I find using the hoop guys adds considerably to tent stability, especially if the wind changes direction and comes from the side. With this tent there is the option of an 'all mesh' inner. For UK hill top conditions I wouldn't advise this. It would be too draughty. Go for the 1/2 solid 1/2 mesh option unless you only plan on camping on balmy summer nights in midge inhabited areas. The tent pitches inner and outer as one, which is great in poor weather. You can use it as a single skin shelter and leave the inner at home if you wish. I use a Tyvek groundsheet to protect the floor from abrasion. I bought this from Tarptent along with the Scarp. It weighs about 70 grams. You can also get Tyvek from backpackinglight.co.uk who sell a single size just big enough to cover the floor footprint and double size which will extend out to cover the porches. I have also heard of other using Wickes secondary glazing film but cannot comment on its strength & durability. The Tyvek has been fine. Overall I have no hesitation in recommending this tent for UK wild camping. Do your research though. There may be more suitable alternatives for you. It also comes in a very spacious 2 man version (Scarp 2) which I have also read very favourable reviews. I have added a few links below which I found useful when researching the tent. The tarptent scarp 1 manual : included pitching guide and basic seam sealing instructions. Blogpackinglight's in depth review and modification suggestions. Robin is a guru in tent-craft and his numerous articles are well worth a read. Hillplodder's Pimp My Tent article where Mathew King talks about his likes and dislikes of the Scarp 1. Philip Werners review on his Section Hiker blog. A video showing the scarp being pitched in perfect conditions on Grasmoor summit in the English lake District. ... and a somewhat more 'tongue-in-cheek' video of it being pitched less than perfectly in windy conditions on Hindscarth, also in the English Lake District. Enjoy !! For anyone who has spent any time hiking with the intention of reaching a hill or mountain summit, the following scenario will no doubt be familiar. Having laboured uphill, sometimes for many hours, you approach the top with a sense of anticipation, eagerly awaiting that magical moment when the forward view suddenly opens out to reveal a breathtaking panorama of distant peaks & plunging valleys. Your camera is at the ready and the weather is perfect. You finally get your first glimpse of the top and …..... suddenly you are confronted by a group of people sat smugly on the summit. They glance over at you with a ‘yep, we were here first’ expression and continue eating their lunch. Having clearly established their ‘squatters rights’, you now have the problem of trying to get to the highest point without disturbing their picnic. All chances of an unimpeded photo have evaporated and that much anticipated image of the summit cairn in the foreground of a pristine backdrop now contains a barrage of brightly dressed folk and their kit. Overall it’s a most unsatisfactory conclusion to a long day’s hike. 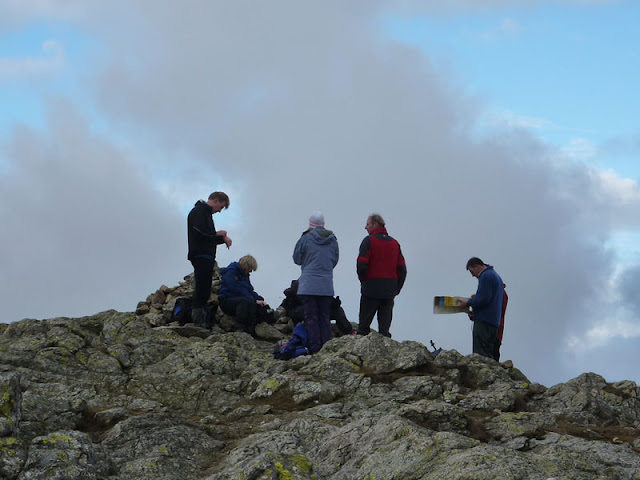 For many people, the objective of a walk in the fells is to attain the highest point, to take the obligatory summit photo and then head back with a sense of rightful achievement. It’s a simple pleasure but the highlight of the walk is the summit and a few hours of hard labour are often spent in pursuit of those precious few moments at the top. How irritating therefore to find yourself facing the previous scenario. Sometimes its lone walkers or couples but the most common offenders are the large groups who occupy summits while eating their lunch and with their gear strewn all over the place as if staging some sort of dirty protest. This is just thoughtless and inconsiderate behaviour. After all, we all want to get to the top, not ‘nearly the top’, but the actual top. We also all want a photograph to remember the day and the views. We don’t want our pictures to be collage of people in fluorescent Gore-Tex. It needn’t be this way though. It is usually not difficult to find a quiet area just away from the true summit, out of sight and out of camera view. There is usually that nice flat spot just off to the side & sheltered from the wind. That is where to sit, to rest & to eat. Don’t perch stubbornly on the apex like an obnoxious child playing ‘king of the castle’. By all means enjoy a mountain top and linger there to your hearts content but when someone else turns up to stand happily on ‘their’ hard earned summit, don’t deny them the simple pleasure that you have just enjoyed. Please be a considerate hiker. Move Off. Don’t be a Summit Slug. Perhaps I'm just being naive, grumpy or idealistic. It's almost certainly an unrealistic proposition to expect such etiqutte on the most popular UK summits (Scafell Pike, Coniston Old Man, Snowdon!) but for the majority of fell & mountain tops I think a little 'summit courtesy' would go a long way. Thanks for reading. Comments and contrary opinions welcome. 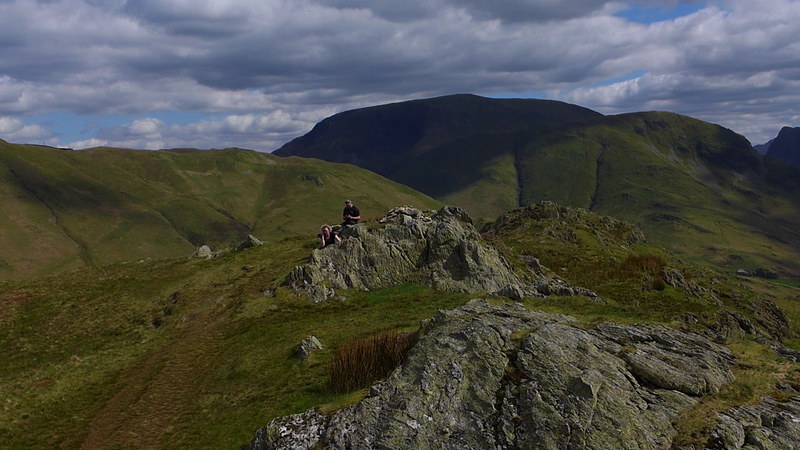 Wainwrights : Rannerdale Knotts, Whiteless Pike, Wandope, Crag Hill (Eel Crag), Grasmoor, Hopegill Head, Whiteside. Time taken : Day 1 = 5 1/2 hours : Day 2 = 4 hours. The weather forecast was about as good as it gets in the Lake District; cold but clear skies, patchy high cloud, no wind and excellent visibility. I therefore decided to head high. Last years Coledale Horseshoe route onto Grasmoor summit had provided some of the best mountian views I have ever been fortunate enough to witness & since then I had intended a wild camp up there. There were a few fells on my 'to do' list on the western side of Grasmoor so a route was devised to link them all up and off I went. The first objective was Rannerdale Knotts. A path leads straight up from Crummock water but hold on .... it was a spring day .... in Rannerdale .... that rings a bell. Bluebells in fact, the famous Rannerdale bluebells would be out! I thought there were more cars parked on the road than expected. A minor diversion was therefore in order to have a look see. It was a worthwhile detour. Back on track I headed up the steep path to Rannerdale Knotts. Thankfully there were lots of photo opportunities along the way to masquerade as rest stops. Now I'm not usually a grumpy fella. I don't really like conflict and tend to let most things slip by without a word but this time I broke from my typical placid demeanor. From about 300 yards away I could hear them well before I saw them. A couple, middle aged and with accents south of the Watford Gap were sat by the summit cairn. She was 'shouting' into her phone while he was eating his lunch and loudly chirping into the conversation at frequent intervals. The cacophony was a sharp contrast to the otherwise peaceful surroundings. It was like something from a Dom Joly sketch. As I very slowly meandered towards the summit it was clear that they had no intention of moving on. I therefore wandered over and stood on the summit cairn taking my photos while receiving annoyed looks as I trod carefully around their sandwiches. As I moved off I asked him if he had ever heard of a 'summit hog'. After repeating myself in order to be heard above his wife, he said "Na Mate, a Sammit Hawg?" "Yes I said, look it up when you get home", and with that, I set off on my way. I hope he did look it up. He would have found something like this which I think sums it up well - Summit Hog. It's common courtesy to move off the summit if someone else arrives. After all, everyone wants to to get the highest point & take their photos without others being in them. Sitting on the top while having lunch and shouting is just rubbing salt in the wounds in my book. Anyway, rant over. If you want to read more of me moaning about this then I have vented my spleen here. My mood quickly improved a further 300 yards on as I finally moved out of Mrs Summit Hog's earshot who was still barking into her phone. The ridge continued on towards the head of the Higher Rannerdale valley before climbing back up the other side towards Whiteless Pike. At this point the numerous other walkers around Rannerdale fizzled away and the fells became quiet and secluded. By the time I reached Crag Hill it was 5pm and the few other walkers I had seen were now heading down. I had taken a leisurely 4 hours to get here and I now just had a simple stroll over to the Grasmoor summit plateau to find a suitable place to make camp. So far it has been exceptionally dry under foot and since leaving Crummock Water I hadn't had any sight or sound of water. I was beginning worry a little as I didn't really have enough to get me through the night, at least not if I wanted a hot meal, coffee and then noodles for breakfast. Luckily I came across some standing water in a few peat hags at the shallow col between Crag Hill and Grasmoor. I filtered 2 litres with the trusty sawyer squeeze filter and made my way up onto the expanse of the Grasmoor summit plateau. Just past the summit shelter the land dropped down to a little grassy area which was sheltered from any easterly or westerly winds whilst having great views down to Crummock Water. A perfect spot. And so at 6pm and with no other hikers in sight I made camp and settled down to watch the sunset over the Irish Sea. The last time I was on Grasmoor it was first light on a February morning after a camp on Sail summit. The scene as the morning sun lit the Buttermere Fells & beyond was stunning and so I was hoping for more of the same. Unfortunately it wasn't to be. I woke to a somewhat hazy & overcast scene with no chance of seeing a sunrise. Ahh well, you can't have it all. I'd been very lucky so far. Despite the disappointingly 'washed out' light, all the high fells were still in view and I headed off towards Coledale Hause well rested and with a spring in the step. From Coledale Hause its a steady trudge up to Sand Hill and then Hopegill Head which has the lofty position of occupying the head of 4 converging ridges. It's a great vantage point. From Hopegill Head an exhilarating ridge is followed towards Whiteside. A steep drop falls way abruptly on the left down to Gasgale Beck, over which the huge bulk of Grasmoor dominates the valley on the other side. To the right (west) are uninterrupted views to the coast and over the Solway Firth to Scotland. From Whiteside summit onwards the terrain becomes decidedly steeper. Crummock Water looks spectacular far below & entices the eyes away from feet which is most unwise on this section. A few stumbles later I learned to pause when gazing down to the waterside 2300 feet below. At this point I met the first of a string of hikers making the upwards journey. Most were curious as to why I was coming down (it was still only 9am) but a few spied the large pack and enquired as to where I'd camped. Eventually the road is reached and I enjoyed a nice stroll along Crummock Water for the last mile to the car back at Rannerdale. Overall this was a great route which would also be achievable in a day and I can highly recommend it. The benign weather and the views from from Grasmoor made for the best wild camp I've had yet. 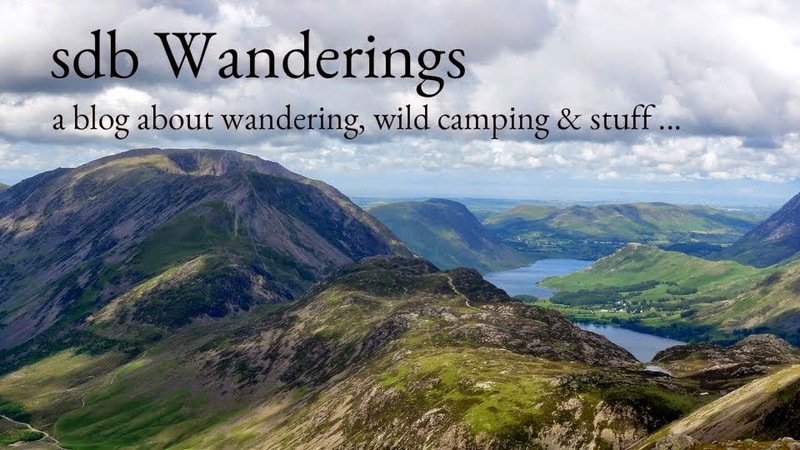 So thats 4 new Wainwrights and 3 old favourites which brings the count up to 132. I'm in no hurry to complete them though. This is something to be savoured, not rushed. I also did a video of the hike which somehow managed to end up 25 mins long. I have posted it here in case anyone wants a look but please make sure you are sat comfortably and with a strong coffee to keep you awake. Pillow : Backpackinglight - Backpacking Pillow (62g) stuffed with Montane Prism 2 jacket. Food : Fuizion Tai Green Chicken Curry, Buttered Bread, Supernoodles,various sugary snacks, coffee, cup-a-soup. Bits & Bobs : headtorch and spare batteries, Iphone + Anker 5800mHh battery, tent light, victorinox knife, map & compass, basic first aid kit and Petzl e-lite, long handles titanium spoon, various fold dry bags, flint & steel. Camera : Panasonic LX7 & lowepro case.